For 2015, the intergalactic perfumery of renegade fashion house, Thierry Mugler is launching a brand new star into the celestial wardrobe of their flagship fragrance, Angel. Dubbed the ‘Gravity Star’, this new 75ml refillable flacon has been designed by Mugler’s Artistic Directors, Virginie Delpeuc’h & Stéphanie Calvi, as a “three-dimensional star that captures light with its countless facets”. Most intriguingly, the flacon has been created with no ‘true bottom’, meaning that it can be placed on any one of its faceted sides. As with all things Mugler, the Gravity Star is beautiful and multi-faceted, changing its form depending on which side it is laid. The asymmetry is remarkable, resulting in Mugler’s most abstract execution of the classic star to date. Faceted like a jewel, the Gravity Star is a luxurious objet d’art that takes Angel far into the future, via the medium of a sharp and angular starburst. The whole thing is incredibly and faithfully ‘Mugler’ from head to toe, and I’d even go as far as saying that it’s one of the best guises we’ve seen our beloved Angel wear. It’s simply stunning. The Gravity Star is yet another example of excellent craftsmanship from the House of Mugler. Since Angel launched in 1992, the fragrance has been housed within a spetacular array or dazzling stars, ranging from classics such as the ‘Nomad Star’ to the alien purple tones of the ‘Etoile Mystique’. 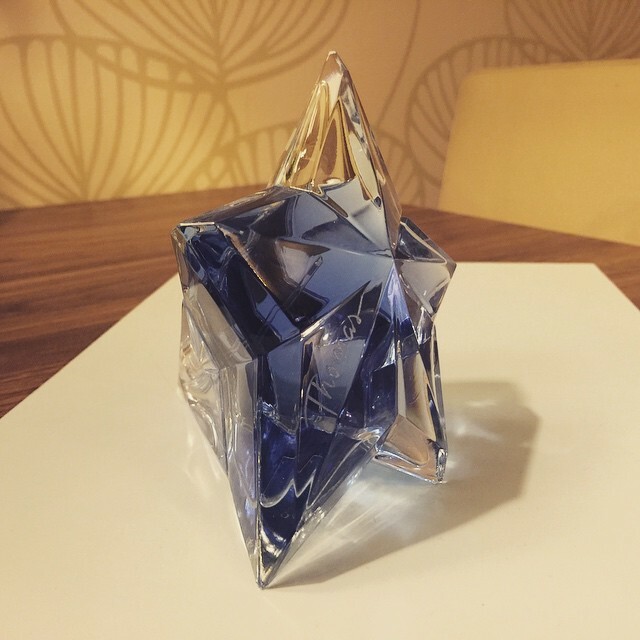 Presentation has always been a key part of the fragrance’s success, and to celebrate this latest instalment in the galaxy of Angel stars, I’ve compiled a retrospective of Mugler’s etoile flacons, in a handy slideshow. So, without further ado, please prepare your vessels for hyper drive and get set to jump below the, err, jump for our tour of the Angel galaxy. “At Mugler, we don’t talk in terms of bottle design; we work around the idea of an object that tells a story. Above all, a Mugler bottle is imagined and designed like a sculpture. In addition, its level of sophistication and beauty makes it a work of art. we’ve propelled it into the future. This is why it has a unique perspective and why the volume breaks with the line’s institutional codes. We wanted a star that would pay tribute to the celestial dimension of Angel, one that would free itself from the laws of gravity. This star belongs in the sky; this is why it has not been designed with a specific ‘bottom’. It can be placed on any of its facets. This is why it defies the laws of gravity. Sample via Mugler. Image 1 my own. Gravity Star images and quotes via press release. Other images via various sources, including; fragrantica.com and boisdejasmin.com. Posted in Thierry Mugler and tagged Angel, Flacons, Gravity Star, Star, Stars, Thierry Mugler. Bookmark the permalink. I am very much in agreement with you. The Gravity Star is stunning. It really does change form dependent on how you position it. Remarkable. Did they rename this the New Star?? I don’t think so. As far as I know it’s the Gravity Star. Ooh! I’ll take a look, thank you!